What methods are available for calculating the appropriate tightening torque for a bolt. Does using an extension on a torque wrench change the abliity to achieve the desired torque value? Some bolts are deliberately tightened past their yield point. Why don't they further yield when an external load is subsequently applied to the joint and come loose? Usually fastener standards specify two types of marks to be on the head of a bolt. The manufacturer's mark is a symbol identifying the manufacturer (or importer). This is the organisation that accepts the responsibility that the fastener meets specified requirements. The grade mark is a standardised mark that identifies the material properties that the fastener meets. For example 307A on a bolt head indicates that the fastener properties conform to the ASTM A307 Grade A standard. The bolt head shown at the side indicates that it is of property class 8.8 and ML is the manufacturer's mark. 1. Slowing down the installation RPM speed may possibly solve or reduce the frequency of the problem. As the installation RPM increases, the heat generated during tightening increases. As the heat increases, so does the tendency for the occurrence of thread galling. 2. Lubricating the internal and/or external threads frequently can eliminate thread galling. The lubricants usually contain substantial amounts of molybdenum disulfide (moly). Some extreme pressure waxes can also be effective. Be careful however, if you use the stainless steel fasteners in food related applications some lubricants may be unacceptable. Lubricants can be applied at the point of assembly or pre-applied as a batch process similar to plating. Several chemical companies, such as Moly-Kote, offer anti-galling lubricants. 3. Different combinations of nut and bolt materials can assist in reducing or even eliminating galling. 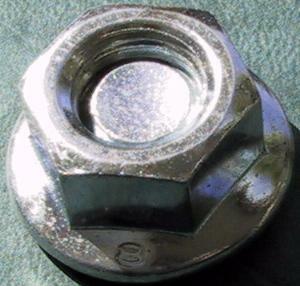 Some organisations specify a different material, such as aluminium bronze nuts. However this can introduce a corrosion problem since aluminium bronze is anodic to stainless steel. With direct shear joints the shank of the bolts sustain the shear force directly giving rise to a shear stress in the bolt. The shear strength of a steel fastener is about 0.6 times the tensile strength. This ratio is largely independent of the tensile strength. The shear plane should go through the unthreaded shank of a bolt if not than the root area of the thread must be used in the calculation. 2. The socket begins to move away from the tightened position in the un- tightening direction. This method is frequently referred to as the "crack-off" method. 3. The fastener is re-tightened up to a marked position. With the "marked fastener" method the socket approaches a marked position in the tightening direction. Clear marks are first scribed on the socket and onto the joint surface which will remain stationary when the nut is rotated. (Avoid scribing on washers since these can turn with the nut.) The nut is backed off by about 30 degrees, followed by re-tightening so that the scribed lines coincide. For methods 1. and 2. the breakloose torque is normally slightly higher than the installation torque since static friction is usually greater than dynamic friction. In my opinion, the most accurate method is method 3 - however what this will not address is the permanent deformation caused by gasket creep. An alternative is to measure the bolt elongation (if the fastener is not tapped into the gearbox). This can be achieved by machining the head of the bolt and the end of the bolt so that it can be accurately measured using a micrometer. Checking the change in length will determine if you are losing preload. The torque in all three methods should be applied in a slow and deliberate manner in order that dynamic effects on the gauge reading are minimised. It must always be ensured that the non- rotating member, usually the bolt, is held secure when checking torques. The torque reading should be checked as soon after the tightening operation as possible and before any subsequent process such as painting, heating etc. The torque readings are dependent upon the coefficients of friction present under the nut face and in the threads. If the fasteners are left to long, or subjected to different environmental conditions before checking, friction and consequently the torque values, can vary. Variation can also be caused by embedding (plastic deformation) of the threads and nut face/joint surface which does occur. This embedding results in bolt tension reduction and affects the tightening torque. The torque values can vary by as much as 20% if the bolts are left standing for two days. 1. Size for size a fine thread is stronger than a coarse thread . This is both in tension (because of the larger stress area) and shear (because of their larger minor diameter). 2. Fine threads have also less tendency to loosen since the thread incline is smaller and hence so is the off torque. 3. Because of the smaller pitch they allow finer adjustments in applications that need such a feature. 4. Fine threads can be more easily tapped into hard materials and thin walled tubes. 5. Fine threads require less torque to develop equivalent bolt preloads. 1. Fine threads are more susceptible to galling than coarse threads. 2. They need longer thread engagements and are more prone to damage and thread fouling. 3. They are also less suitable for high speed assembly since they are more likely to seize when being tightened. A high bolt preload ensures that the joint is resistant to vibration loosening and to fatigue. In most applications, the higher the preload - the better (assuming that the surface pressure under the nut face is not exceeded that is). The preload is related to the applied torque by friction that is present under the nut face and in the threads. The torque value depends primarily on the values of the underhead and thread friction values and so a single figure cannot be quoted for a given thread size. It is important to note that it does not take into account the torsional stress as a result of the tightening torque. High friction values can push the actual combined stress over yield if high percentages are used. (The tensile stress from the preload coupled with a high torsional shear stress from the torque due to thread frictional drag results in a high combined stress.) The percentage yield approach works well in most practical circumstances but if you are using percentage of yield values over 75% then you could be exceeding yield if high friction values are being used. One way to over come this limitation is to use the percentage of yield based upon the combined effects of the direct stress (from the bolt preload) and the torsional stress (from the applied torque). Using this approach to specify torque values is more logically consistent and can reduce the risk of the yield strength of the bolt being exceeded - especially under high thread friction conditions. A figure of 90% of yield is typically used here when the combined stress (usually calculated as the Von-Mises stress) from the direct and torsional stresses is calculated. Our Torque and BOLTCALC programs uses this approach and a copy of the demo program can be downloaded from our web site. The help file provided with the demo program does provide additional information on this topic. Normally it will not matter whether the bolt head or the nut is torqued. This assumes that the bolt head and nut face are of the same diameter and the the contact surfaces are the same (giving the same coefficient of friction). If they are not then it does matter. Say the nut was flanged and the bolt head was not. If the tightening torque was determined assuming that the nut was to be tightened then if the bolt head was subsequently tightened instead then the bolt could be overloaded. Typically 50% of the torque is used to overcome friction under the tightening surface. Hence a smaller friction radius will result in more torque going into the thread of the bolt and hence being over tightened. If the reverse was true - the torque determined assuming that the bolt head was to be tightened then if the nut was subsequently tightened - the bolt would be under tightened. There is also an effect due to nut dilation that can, on occasion, be important. Nut dilation is the effect of the external threads being pushed out due to the wedge action of the threads. This reduces the thread stripping area and is more prone to happen when the nut is tightened since the tightening action facilitates the effect. Hence if thread stripping is a potential problem, and for normal standard nuts and bolts it is not, then tightening the bolt can be beneficial. 1. How many and what size/strength do the fasteners need to be? Other than rely upon past experience of a similar application an analysis must be completed to determine the size/number/strength requirements. A program like BOLTCALC can assist you with resolving this issue. 2. The bolt material to resist the environmental conditions prevailing. This could mean using a standard steel fastener with surface protection or may mean using a material more naturally corrosion resistant such as stainless steel. The general underlying principle is to minimise the cost of the fastener whilst meeting the specification/life requirements of the application. Each situation must be considered on its merit and obviously some detailed work is necessary to arrive at a detailed recommendation. i.e the torque will be increased. Nut thickness standards have been drawn up on the basis that the bolt will always sustain tensile fracture before the nut will strip. If the bolt breaks on tightening, it is obvious that a replacement is required. Thread stripping tends to be gradual in nature. If the thread stripping mode can occur, assemblies may enter into service which are partially failed, this may have disastrous consequences. Hence, the potential of thread stripping of both the internal and external threads must be avoided if a reliable design is to be achieved. When specifying nuts and bolts it must always be ensured that the appropriate grade of nut is matched to the bolt grade. The main purpose of a washer is to distribute the load under the bolt head and nut face. Instead of using washers however the trend as been to the use of flanged fasteners. If you compute the bearing stress under the nut face it often exceeds the bearing strength of the joint material and can lead to creep and bolt preload loss. Traditionally a plain washer (that should be hardened) is used in this application. However they can move during the tightening process (see below) causing problems. Research indicates that the reason why fasteners come loose is usually caused by transverse loadings causing slippage of the joint. The fastener self loosens by this method. When using impact tightening tools there is a large variability in the preload achieved by the fastener. The tightening factor is between 2.5 and 4 for this method. (The tightening factor is the ratio of max preload to min. preload.) Software such as our BOLTCALC program allow for this by basing the design on the lowest anticipated preload that will be achieved in the assembly. Because of changes in the thread condition itself - different operators etc. it could be that lower values of preload are being achieved even though the assemblies may appear to be identical. Torque to yield is the method of tightening a fastener so that a high preload is achieved by tightening up the yield point of the fastener material. To do this consistently requires special equipment that monitors the tightening process. Basically, as the tightening is being completed the equipment monitors the torque verses angle of rotation of the fastener. When it deviates from a specified gradient by a certain amount the tool stops the tightening process. The deviation from a specified gradient indicates that the fastener material as yielded. The torque to yield method is sometimes called yield controlled tightening or joint controlled tightening. I had been of the opinion that when two nuts were being used to lock a thread, the thicker of the two nuts should go next to the joint. I had this as one of the 'tips for the day' on some software and a couple of years ago was taken to task that this was wrong. The thin nut he said should go next to the joint. using two nuts was a popular method on old machinery - and the ones that I had seen all had the thin nut on top of the thick nut. nut. This helps to prevent self-loosening and improves the fastener's fatigue performance by modifying the load distribution within the threads. Doing it the other way, thin nut on top of the thick nut, does not jam the parts together sufficiently. Two years on and I am still unconvinced. I am still asked the two nut question but I always tend to recommend other more modern ways of locking the threads. I think that the reasons that I am not easy with the method is that it is too reliant upon the skill of the person tightening the joint. There is also the amount of backlash in the threads (you could strip the threads of the small nut if it was a tight fit) and the preload will be down on what it could be as well. There are some building codes that stipulates that there must be at least one thread protruding through the nut. However it is common practice to specify that at least one thread pitch must protrude across a range of industries. Typically the first few pitches of the thread can be only partially formed because of a chamfer etc. In summary the full height of the nut is to be used if you are to avoid thread stripping. Have a look at information on the website on the BOLTCALC program and thread stripping - there is a tutorial/presentation available from the website. In terms of maximum protrusion I have not come across any guidelines on this point other then minimise to avoid wasting material. See shortbolting.htm for more information on this topic. 1. A significant proportion of the torsion in the bolt, typically 50% or so, disappears as soon as the tightening operation is concluded. There is a change in the torque reaction within the fastener. For example, if the nut is tightened, there will be a torsion acting down the shank being driven from the socket and reacted at the bolt head. When the socket is removed, the torsion is then reacted between the nut face and the bolt head with it being reduced by 50% or so. The remaining torsion is thought normally to disappear as a result of embedding/relaxation losses. 2. A new yield point forms at the point on the strain curve that the bolt had been tightened to. This effect is referred to as the Bauschinger effect (more details on this effect is available at https://en.wikipedia.org/wiki/Bauschinger_effect). The net result of these two effects discussed above is that even with the bolt tightened plastically it will perform elastically when external loads are applied to the joint. Obviously there are limits to the magnitude of the load that can be applied before yielding occurs. In many applications, joint separation occurs before the bolt yields. One important exception is for joints consisting of different materials subjected to a significant temperature change. One such application is a steel bolt in an aluminium joint. In such joints the bolt can further yield as a result of differential thermal expansion subsequent to it being tightened. (The coefficient of thermal expansion of aluminium is broadly twice that of steel and so the joint thickness increases with rising temperature at a greater rate than the steel expands.) Effects such as a reduction in the yield strength of the material at an elevated temperature can also play a part. In some of these cases, for example cylinder head bolts, yielding can occur when the engine first starts and heats the block but the yielding is limited and is stabilised in subsequent heat-cooling cycles.